This will make one large heart shaped or two small heart shaped pavlovas. Up until a month ago, I had never made a pavlova. Ever. That all changed when the lovely Leonie shared her never-fail recipe with me and she has kindly agreed to let me share it with you. Since I got this recipe, I have turned into a pavlova making machine! If I knew it was this easy to get my pav on, I would have made one years ago! You don’t even need any fancy gadgets for this, I whip my pav up with my nana’s electric whisk. True story. Anyhoo, I love love and I love Valentine’s Day but I don’t love the commercialism that comes with it. These days we celebrate with a delicious dinner at home which is much more romantic than splashing the cash at an overpriced and super busy restaurant. 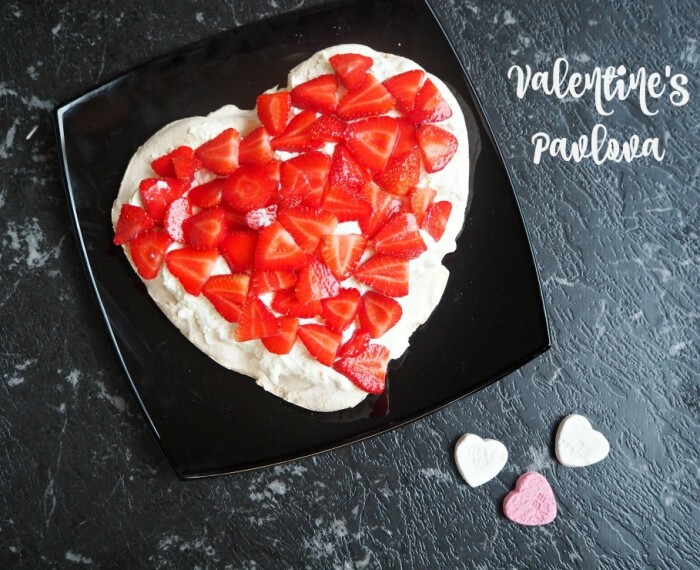 If you’re thinking of dining in this Valentine’s and don’t know what to make for dessert, then look no further! 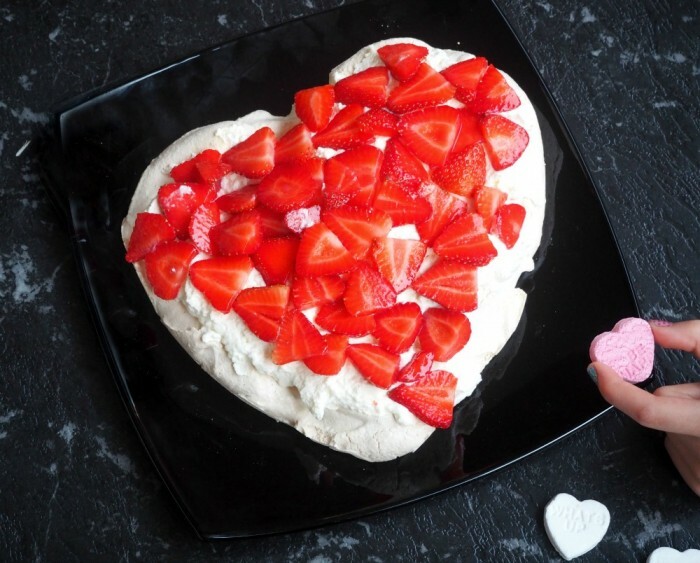 This heart shaped pav is super simple, looks sensational and tastes ah-mazing! And if you haven’t got anyone to share it with, treat yo’self! Preheat oven to 140 C /120C fan-forced. If you are making two small pavs, draw two heart shapes on baking paper, using a 7 inch round cake tin as your guide. If you are making one large pav, sketch out one large 12 inch heart. Alternatively if you have a heart shaped springform tin, you can use the springform part as your baking template for one small pav, just line the sides with baking paper first. Place your templates on one (for the large pav) or two trays (for the small pavs) lined with baking paper. Mix granulated sugar and cornflour together and set aside. Beat egg white and salt until stiff and dry. Add the caster sugar gradually, beating well between each addition. Add the lemon juice, granulated sugar and cornflour mix and lightly fold into mixture. Spread the egg white mixture onto the heart shape, making sure you build the edges up slightly. If you are using your springform heart, fill it with half the pav mixture. Bake in a slow oven for 30 to 40 minutes. When the pav is cooked, leave it in the oven with the door closed until it is completely cool. 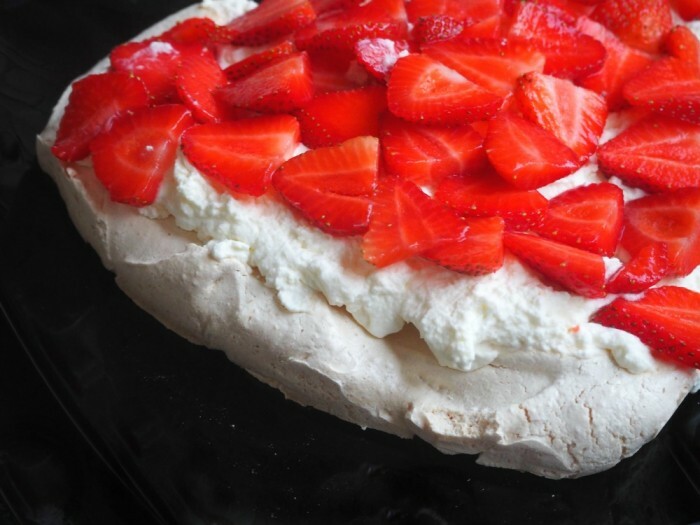 Whip up the cream and top the pav with whipped cream and sliced strawberries. If heart shapes aren’t your thing, this will make 2 small round pavlovas. Simply turn two shallow 7 inch baking tins upside down, line the top with baking paper and plop on your pav mixture for perfect pavlovas. Every. Single. Time.